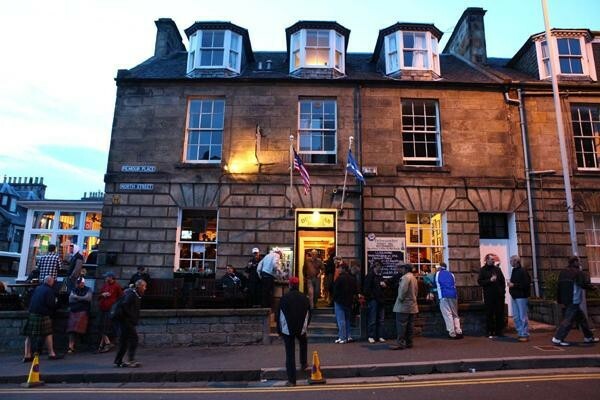 Just about every golfer who’s made the pilgrimage to St. Andrews to play the Old Course has included, as part of their agenda, a visit to the Dunvegan Hotel. 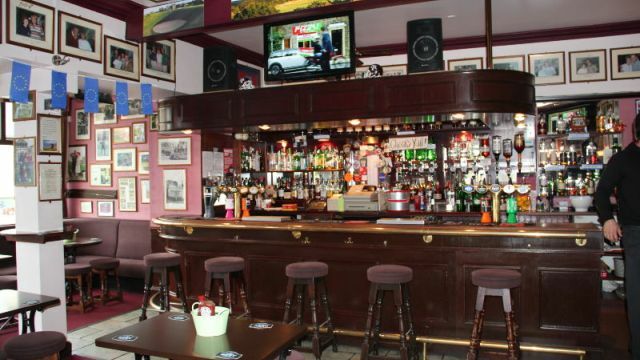 Even if you haven’t heard of the Dunvegan before arriving in the Auld Grey Toon, you’ll soon find yourself gravitating toward the sounds of laughter, clinking glasses, and then the site of a small building filled with people – mostly in plaid sweaters and windshirts – having a wonderful time, and spilling out onto North Street. If there’s a professional tournament going on in town, then sure as the sun rises over the North Sea, there’s bound to be someone you’ll recognize having a pint and regaling a dozen or so fellow travelers with a story or a song. The happy fact that the Dunvegan sits about 100 yards in a straight line off the edge of the 18th green makes it probably the most convenient non-clubhouse 19th hole on the planet. And certainly the most famous. The new owners call themselves Forth Bridge Capital, a sober-sounding name for three guys who love golf and its broader culture, love St. Andrews, love Scotland, and love beer – not necessarily in that order. Two of them – Eric Drinkwater and Andrew Clark, both from Toronto – have had several years experience in the golf travel business, but particularly focusing on Scotland and Ireland. The third partner, Gill Broome from Montreal, is a merchant banker who’s also immersed in the golf industry otherwise. Through their close connections, the three heard last summer that Jack and Sheena were looking to sell, and pounced on the opportunity. Nine or ten bidders ultimately submitted from around the world, but in the end, it was the Canadian lads who came up roses. “I think we won the bid because we knew Jack and Sheena, but more importantly, they knew us. They knew that our love of the place was longstanding and sincere, and that our promises to keep it as ‘business as usual’ weren’t just empty words,” said Gill Broome by phone the other day. The fact that Jack and Sheena have been maintained by Forth Bridge as minority shareholders in the business was a masterstroke that will ensure some continuity in the enterprise. 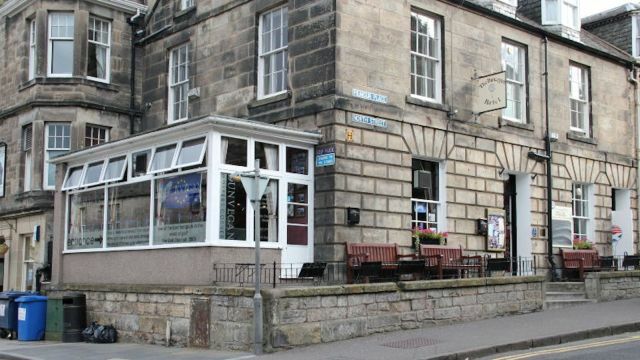 The Dunvegan is a year round favourite but particularly during Open Week. How does the town feel about one of their iconic properties falling into foreign hands? Gill tells me that over the next several months, some new names may become involved with the business as minority shareholders. 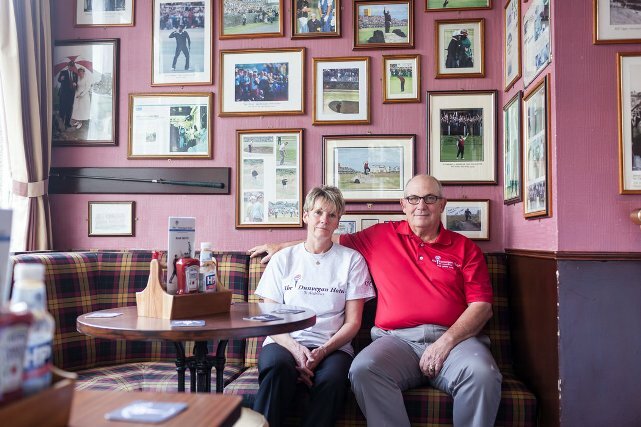 These will be instantly recognizable names within the worldwide golf community… another smart PR move, especially if these folks will show up unexpectedly to quaff an ale with the regulars, as well as lend their names. And while the intention is business as usual, and the property itself is limited in scope, Gill says that the partners do foresee areas for growth. It’s not uncommon to find celebrities such as Clint Eastwood and Kevin Costner at the Hotel. A visit to the Dunvegan website (HERE) will give neophytes a good sense of the atmosphere of the place, and an understanding of why it attracts the pro’s, the stars, and the wanna-be’s (like me) in almost equal measure. The place is not big, the accommodations upstairs are not 5-star, and the beer’s just as good at any other pub in the British Isles. 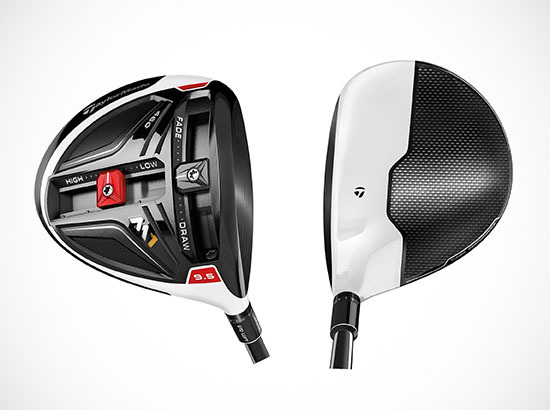 But there’s something in the air there, and it can only be described as the universal fellowship of golf, and the magnetizing force of the home of the game. And now, there’s a little bit of Canada that’s taken its rightful place in the vortex. Jim, loved your posting – we’re heading there in May. Except I think you should have used poutine instead of a beaver tail in your heading!